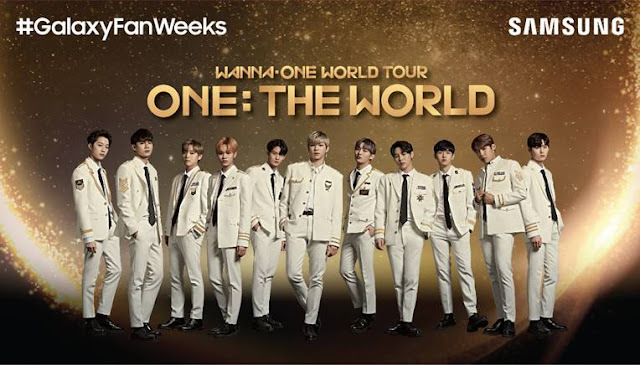 GOKPOP | Exclusive K-News in Malaysia & Singapore: Win the Golden Opportunity to meet Wanna One LIVE & Walk Away the Limited Edition Merchandise! Win the Golden Opportunity to meet Wanna One LIVE & Walk Away the Limited Edition Merchandise! Malaysia’s Wannables, it is time to get excited as your favourite K-group boy band Wanna One is returning to Kuala Lumpur to perform their hit singles in their Wanna One World Tour on 21 July 2018! To add to the excitement, Samsung Malaysia Electronics will be giving you the opportunity to win a pair of VIP tickets worth RM1,596 to catch Wanna One live in action! “Wanna One is one of South Korea’s most popular rising groups, and we couldn’t be more excited to see them in person! We want to share our immense enthusiasm for their debut in Malaysia, and what better way to do that than to send the fans there ourselves? Don’t miss this chance to be a part of their grand world tour!” said Yoonsoo Kim, President of Samsung Malaysia Electronics. To be in the running to win a pair of golden tickets to Wanna One’s World Tour in Malaysia, what you need to do is to own the new Samsung Galaxy A6+, A6, J6 or J4. ps: our Ji Hoon's signature pose&phrase "내 마음 속에 저장"
Step 2: Upload photo on Instagram/Facebook and complete the caption below with no more than 50 words "I will save Wanna One in my Galaxy because..."
ps: exercise your creativity to design your catchiest phrase! The top 150 winners with the best poses and captions will win a pair of golden tickets and winners’ announcement will be made via Samsung’s website and Instagram page. Pick up a new Samsung Galaxy A6+, A6, J6 or J4 today! From 25th June onwards, you can also bring home an array of amazing Wanna One limited edition merchandises at selected outlets while winning yourself an epic experience with Wanna One! 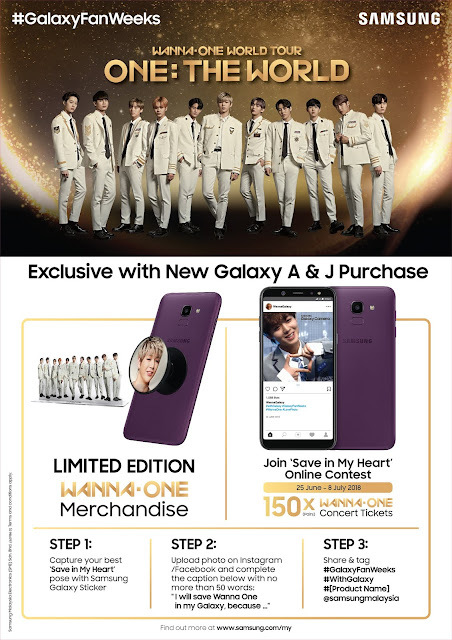 To understand more about the contest and the golden ticket prizes to Wanna One’s World Tour in Kuala Lumpur, please visit http://www.samsung.com/my/offer/mobile-wannaone/.